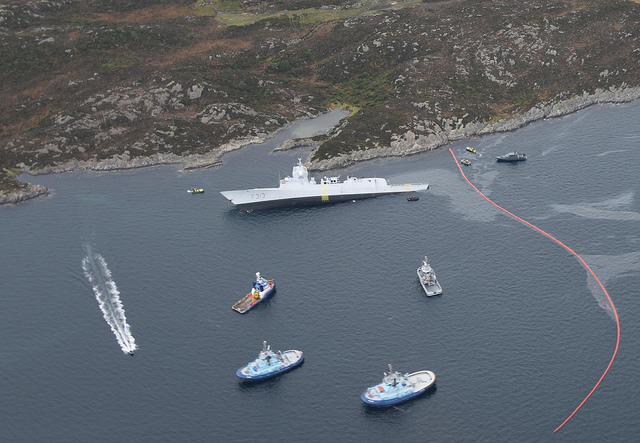 In an incident that has attracted relatively little media attention in Australia, the modern 5,300-ton Norwegian frigate KNM Helge Ingstad sank  in a Norwegian fjord after a collision with the large Maltese-registered oil tanker Sola TS. It’s now clear  what happened. In the early hours of 8 November, the Ingstad was proceeding at 17 knots along the Hjeltefjorden near the Sture oil terminal. The Sola TS had just left the terminal fully laden and was proceeding at 7 knots. The watch on the Ingstad, which had just changed, thought that the deck lights of the tanker were part of the well-lit terminal. The Sola TS became concerned about the situation. However, because the Ingstad wasn’t showing automatic identification system  (AIS) data, initially neither the Sola TS nor the traffic station on shore could identify the frigate to warn it of the imminent danger. Repeated warnings to the Ingstad after it had been identified failed to get it to alter course until just seconds before the collision. The heavily laden tanker couldn’t manoeuvre out of the way. Navantia has produced several designs similar to the Nansen class, including under the trilateral frigate agreement  set up by the Netherlands, Germany and Spain. Through this agreement, the F100 class of frigates is being built in Spain by Navantia, and the Dutch De Zeven Provincien class and the German F124 Sachsen class are being built by other companies. A preliminary investigation  by Norwegian authorities found that confusion on the Ingstad’s bridge was the immediate cause of the collision, but that the ship sank because of progressive flooding. After the collision, water quickly moved through several watertight compartments, apparently via the ship’s propeller shafts, which pass through the bulkheads between the compartments through theoretically watertight openings (known as stuffing tubes or stuffing boxes) that should prevent progressive flooding. Based on crew interviews, authorities determined that the stuffing boxes weren’t working properly, jeopardising the watertightness of the ship. The investigation report warned that the faults that sunk the Ingstad could also be in other Navantia ships, raising questions about a possible problem with the design. The Ingstad accident has eerie similarities to the serious collisions  suffered by US Navy destroyers during a horror year  in 2017. The Ingstad was proceeding at excessive speed in a busy shipping area and wasn’t showing AIS information, and the team on her bridge clearly lost situational awareness and failed to appreciate the serious situation that was developing. There are lessons here for navies around the world. First, for questionable operational security reasons, warships often don’t show AIS data, even though it’s a vital collision-avoidance mechanism that’s used extensively by the commercial shipping sector. Not using AIS may be acceptable on the open ocean, but it’s poor practice in busy shipping lanes. After the US Navy accidents, the chief of naval operations instructed his ships to show AIS  when they’re in heavy shipping traffic. This was apparently a message that had not got through to the Royal Norwegian Navy, although it’s been reported that an American naval exchange officer  was onboard the Ingstad at the time of the collision. Second, the high-tech bridge of a modern warship isn’t amenable to using the most basic sensory mechanism of all—what is often referred to as either the ‘seaman’s eye’ or the ‘Mark One eyeball’. The many screens and electronic data systems on a bridge can preoccupy the bridge team and distract them from what is happening around them. An accident such as that suffered by the Ingstad can have many causes, the sum of which leads to the collision. In addition to the ones already mentioned, two other factors contributed to the incident. First, the collision occurred soon after the watch had changed on the bridge, and the incoming watch may not have gained a proper perspective of the situation that was emerging. Second, the tanker was extensively lit up by deck lights that may have obscured the navigational lights, leading the incoming watch to believe that the Sola TS’s lights were part of the terminal. A fully professional bridge team, however, should have observed that the tanker was both underway at seven knots and showing AIS. The incident raises questions about the survivability of modern warships with their lightweight construction and a design emphasis on their weapons and sensors rather than on ship integrity and damage control. It also raises questions about the basic training and seamanship skills of bridge watchkeepers. The high-tech bridges of modern warships can be congested with both people and equipment. This environment is not conducive to the exercise of basic safe seafaring practices, such as the use of the ‘seaman’s eye’. Modern navies must ensure that their bridge personnel are safe seafarers, as well as skilled equipment operators. Sam Bateman is a professorial research fellow at the Australian National Centre for Ocean Resources and Security at the University of Wollongong. Image courtesy of the Norwegian Coastal Administration on Flickr.